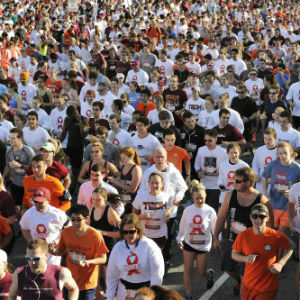 Virginia Tech’s 3.2-Mile Run in Remembrance, an annual event that honors and remembers the 32 individuals who lost their lives on April 16, 2007, will be held April 15 starting at 10 a.m. on the Virginia Tech campus. Now in its ninth year, the event will start on the Drillfield near War Memorial Gym and finish near the April 16 Memorial across from Burruss Hall. It will be held rain or shine. In the event of severe weather, the status of the run will be posted to the university homepage. The event is free and open to the public, and individuals may run, walk, or push a stroller on the 3.2-mile course. Participants are asked to preregister for the event at the Department of Recreational Sports website. Last year, more than 11,000 people participated in the event. The route for the 3.2-Mile Run in Remembrance will take participants throughout campus, around the Duckpond, and through the home team tunnel used to enter Lane Stadium before returning to the Drillfield via Kent Street. Individuals are required to check in for the run either April 14, from 4 to 8 p.m., or April 15, from 7:30 to 9:30 a.m., in 125 War Memorial Gym (basketball gym). Those registered must bring their confirmation email that includes their QR code printed on paper or on an electronic device. Participants can request a new confirmation email by going to the Virginia Tech Recreational Sports website. 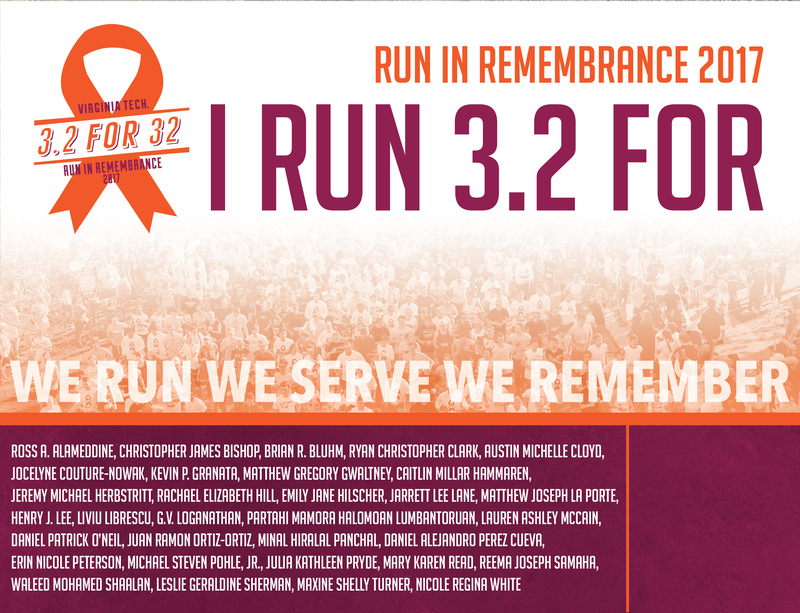 3.2-Mile Run in Remembrance participants will receive a free T-shirt. Any shirts that have not been picked up by 8:30 a.m. on Saturday will be given away on a first-come, first-serve basis. Run bibs will be distributed at check in. Bibs will be used if participants wish to leave a bag at the bag drop on the Drillfield. For alumni and others who plan to run in a 3.2-mile event in their community may download one. Participants will be organized in three waves at the start of the event. The first wave will be for those who will run; the second wave will be for those who will jog or walk fast; the third wave is for those who will walk or those individuals with a stroller. Volunteers will be holding signs indicating each wave so runners and walkers will know where to go. At 10 a.m., the run will begin with a moment of silence lasting 32 seconds, followed by the start of each wave separated by a few minutes. An aerial photo will be taken on the Drillfield prior to the run at 9:45 a.m. Participants are asked to wear the maroon event T-shirt or other maroon Hokie shirt. Following the event, all participants and members of the broader New River Valley community are invited to attend the community picnic on the Drillfield, sponsored by the Virginia Tech Student Government Association. Some food and beverage will be provided. Should there be inclement weather, the picnic will be in Commonwealth Ballroom. Free parking is available for the 3.2-Mile Run in Remembrance in all Perry Street lots and the Perry Street parking garage located off Prices Fork Road. More information about the activities planned for the Day of Remembrance on April 16 is available online.